The jury is out on a love it or leave it case with Sufix as the main suspect. As anglers, we know that no verdict will ever come through. Preference when it comes to braided fishing line is a personal decision. For those still on the fence about which braid to use, Sufix Performance Braid has its advantages as well as its drawbacks. Jump right in to get all the details. 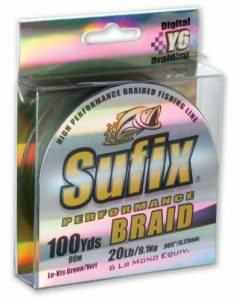 Product: Sufix Performance Braid – Braided Fishing Line. A tight weave makes Sufix Performance Braid stiffer than other lines. At the same time, that tight weave makes the line thinner and stronger than other braided lines. Using a six carrier weave and strong Dyneema fibers, Sufix Performance Braid is their original line. It comes in three color options and tests from 6 to 130 pounds. Choose from spool lengths between 100 and 3500 yards. The mainstay of Sufix braided lines is the Dyneema fibers they consist of. With an original construction for military applications, Dyneema has virtually no stretch and is comparable in strength to kevlar. Sufix Performance Braid uses 6 strands of Dyneema fiber to complete the weave. It’s not just the fact that Sufix weaves 6 strands of Dyneema in the manufacturing of their Performance Braid that makes it so strong. What makes the line stand out is the Sufix Y6 technique. Y6 braiding is a process that completes more picks per inch than other braided lines. What are picks per inch? Each pick is a completion of one weave of knots that then tie down on the last weave. The more picks per inch, the tighter the picks go down on top of each other. The result of 2 to 4 more picks per inch than other braided fishing lines is multi-advantageous. It creates a thinner and rounder line, but also a stiffer line. Like other braided lines, Sufix Performance Braid has near zero stretch. Due to the tightness of the line, it helps reduce wind knots. This makes it one of the best choices for spinning reel applications. Because the Y6 technique produces a rounder line, it also casts silently and with more distance. The ability to reduce wind knots on spinning reels is a big advantage for that style of fishing. With a tighter weave, the line doesn’t soak up as much water as looser braids. No matter which type of reel you prefer, a thinner line means you’ll wrap more of it on your spool. Because the weave has more picks per inch than most braided fishing lines, it comes out rounder. This creates a silent pass through the guides of your rod and achieves better distance when casting. Like almost every other braided line, Sufix Performance Braid will lose its color in time. Having a tighter weave produces a stiffer line which not all anglers desire. Many prefer the soft feel of Power Pro Super 8 Slick or the Sufix 832 Advanced Superline. Despite the claims of a silent far casting braid, some anglers report the opposite in the heavier tests. Though anglers leaving these reports may be coming from a softer treated line, they are still worth mentioning. That stiff braid in 50 + pound test may not be the best for larger spool conventional reels. 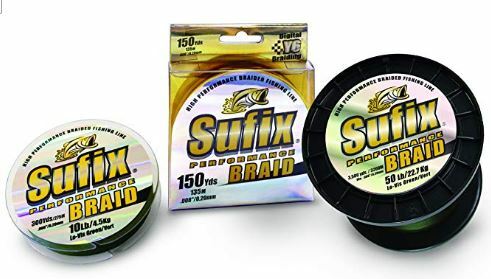 Sufix Performance Braid performs best on spinning reels or baitcasters. Does this mean it won’t work with conventional reels at a heavier test? Absolutely not! It’s still a strong, thin braid that has no stretch. 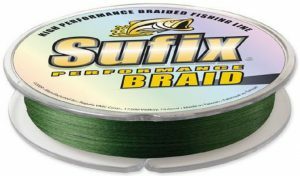 If you’re using a braid on a lighter spinning reel and have problems with wind knots, consider switching to Sufix Performance Braid. A visit over to the Rapala website shows a ton of information, though not too much about the Performance Braid. Check out their Customer Service page, but you can also send an inquiry via email on their Contact Us page. Another good source of information is on the Sufix FAQ page. Rapala has a return policy of 30 days from the date of purchase with no questions asked. Check the Return Policy page for full details. There are no warranties on Sufix products. Braided fishing lines have different characteristics and each serves a certain purpose. 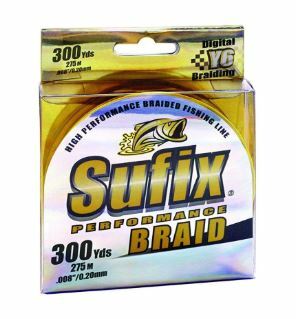 Sufix Performance Braid definitely fills the need for a stiffer line that reduces wind knots. Reports of the line getting rougher and louder as the test increases are concerning. Though many prefer the smooth feel of Power Pro, Performance Braid by Sufix is cheaper and is still an effective line. What are your experiences with Performance Braid? Leave us your thoughts in the comments below.